I met Debbie in Amsterdam a few years ago at a friend’s farewell picnic. Her son Asher, then about 10 years old, bounded up to our picnic blanket with a delighted exclamation, “Plums! I love plums!” It’s the kind of introduction you never forget and their whole family have become good friends of mine. I’ve been for innumerable lunchtime walks just with Asher hearing about everything from how lasers work (don’t ask me to explain! ), everything you didn’t know you wanted to know about marine biology (including sub-classifications I never heard of in my biology lessons), getting to discuss the pros and cons of various fonts (our least favourite being comic sans and papyrus), and anything else the boy is interested in. It takes a special kind of person to raise a differently wired kid like Asher and Debbie shares her journey with others helping them to see that being differently wired is a difference, not a deficit. I’ve been asked a lot about differently wired children (read on to find out what this means) and, I’ll be honest, it’s not my speciality. 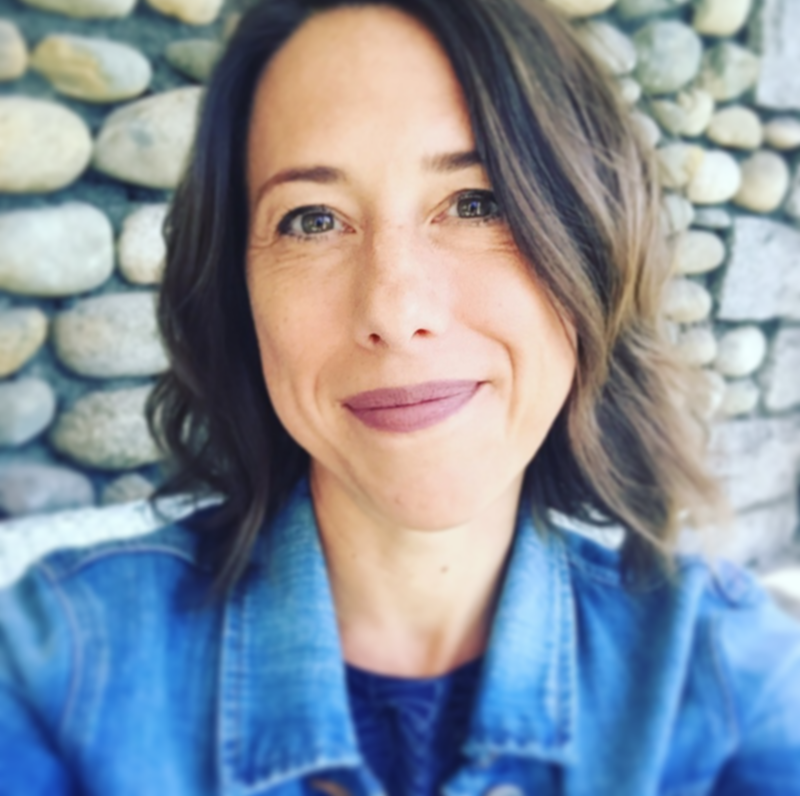 So, as I’m on the road, I thought it would be the perfect opportunity to ask Debbie if she would write something for all you parents who may be wondering if your child might be differently-wired and what you can do about it. I asked her to explain what some neuro-differences look like and her favourite book, conversation, and resource for each. Is your child more sensitive to sounds than other toddlers or he is a child who doesn’t ever seem to slow down? Maybe she has an unusually rich vocabulary for a child her age or he finds working with small manipulatives challenging for his little fingers. When some aspect of our child’s development appears to be different from his or her same-age peers, many parents wonder if their child is developing “typically,” and if not, what does that mean? I use the differently wired to describe kids who are moving through the world in a less typical way. This catchall phrase includes children with everything from ADHD or learning disabilities like dyslexia to children who are gifted, autistic, or highly sensitive. And while differently wired isn’t a formal diagnostic term, it has resonated with many people because it has a positive connotation, while also explaining differences and embracing uniqueness, which is important when we consider that being “atypical” is more normal than most people realize. In fact, at least one in five people today is in some way differently wired. Because many differently wired children have “invisible differences,” meaning they aren’t glaringly obvious, many parents struggle to determine what, if anything, is going on with their child. While it might be scary or upsetting to consider our child is on a different path than the one we expected, the truth is that being neurologically different doesn’t mean “worse” or “bad.” Rather, it means unique, and as such, these children will benefit from parents and educators who commit to understand who they are, embrace their unique strengths and areas for growth, and get curious about how to help them thrive. 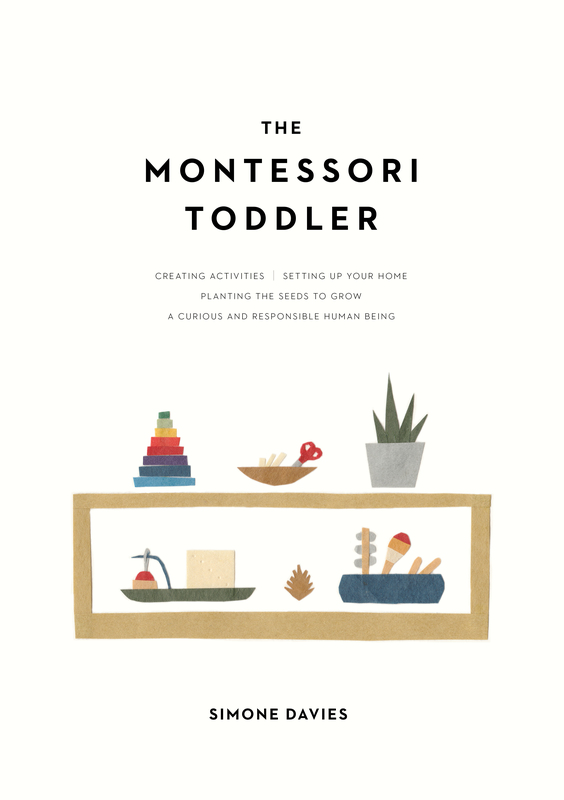 Here is a quick overview of some of the ways children can be differently wired today, along with a few of my favorite resources. Autism Spectrum Disorder (ASD) is a neurodifference that is typically marked bysocial, communication, and behavioral challenges. For example, some autistic children may struggle with making eye contact, and others may engage in repetitive behaviors or movements and/or have challenges related to speech and nonverbal communication. Many autistic children have deep areas of interest; they may crave structure, routine, and order. And because autism is truly a spectrum with no rigid definition, a wide range of behaviors may or may not fall into the diagnosis. Children with sensory processing issues have challenges related to the way their brain interprets and responds to sensory information. They might be sensory seeking (hyposensitive), sensory avoidant (hypersensitive), or a mix of the two. Certain environments teeming with sensory input—water parks, movie theatres, amusement parks, and more—or certain emotional circumstances can be very disregulating. Likewise, children who’ve been identified as “highly sensitive kids” often have an overly strong empathic response—for instance, they might cry for days after mistakenly stepping on a beetle. Though there is no one agreed-upon definition, giftedness typically refers to people who demonstrate unusually high aptitude in intelligence and/or creativity ability. Because giftedness can take many forms, it can look many ways. A gifted child might be an early reader; have excellent memory recall; have an unusual knack for math and numbers; have an ear for music and easily learn how to play new instruments. Though there is a belief that gifted children are wired to thrive, many children develop “asynchronously”—their intellectual abilities vastly differ from their social / emotional maturity—and this disconnect can create significant challenges. Attention Deficit Hyperactive Disorder / Attention Deficit Disorder is a brain condition that often comes with the markers of being highly energetic, fidgety,distractible, and/or impulsive; it can also look like “hyperfocusing” or daydreaming. Studies show that more than 10 percent of today’s kids have ADHD/ADD, and though boys are diagnosed nearly twice as often as girls, it’s believed that it actually affects the number of girls, but just presents differently. ADHD/ADD comes with many unique gifts, which often include being highly creative, multipassionate, entrepreneurial, and having boundless energy and ideas. Because anxiety manifests in different ways, it can be hard to recognize in children. Kids with anxiety disorders may feel regulated and calm some days and completely shut down on others. Situations that stress out even the calmest of children can completely derail a child with anxiety. Some anxious kids might break down and cry or withdraw into their shells, and others will act out, unable to make sense of the powerful anxiety in their system. Learning disabilities, can impact everything from a child’s ability to read, write, and do math, to organizing, planning, and reasoning. The most common learning disability is dyslexia, a difference resulting in difficulty with reading and fluency. Less familiar are dysgraphia (difficulty with writing), dyscalculia (difficulty with math), executive functioning issues, slow processing speed, nonverbal learning disorder, auditory processing disorder, and visual processing issues. Learning disabilities can often be tricky to identify. Many kids overcompensate for their disability, while in other cases, their challenges may manifest in what appears to be “bad behavior” or disorganization. Still other children may be considered not as bright when in reality it is their unique learning needs that aren’t being met. Twice exceptional, or “2e,” refers to intellectually gifted people with at least one other neurological difference. Twice-exceptional kids often find themselves in an especially tricky spot. In some cases, a child’s giftedness masks their neurodifference—they’re so bright that they’re able to compensate for their deficits. More common, though, are the kids whose neurodifference masks the giftedness. Because their cognitive development is so uneven, helping a 2e child thrive often requires a lot of individualization. Debbie has written a whole book for parents about raising differently wired children which I highly recommend for the emotional shifts you can make as a parent to help you support your child. 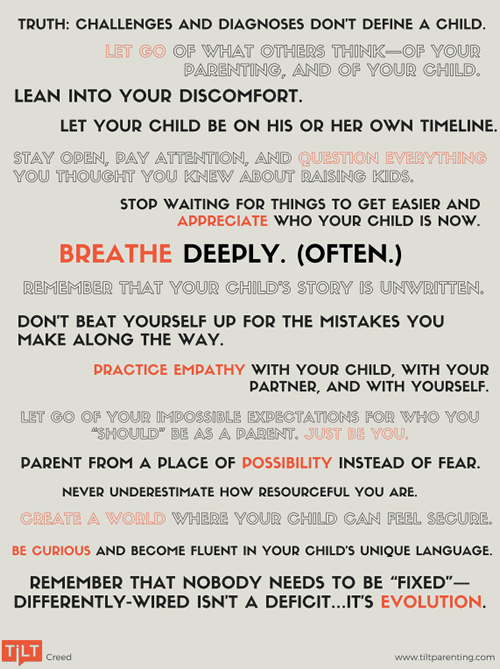 To get you started, here are some of the ideas summarised in the Tilt Parenting creed, basically how you can tilt your parenting. A big thank you to Debbie for getting us started if our child might be differently wired. 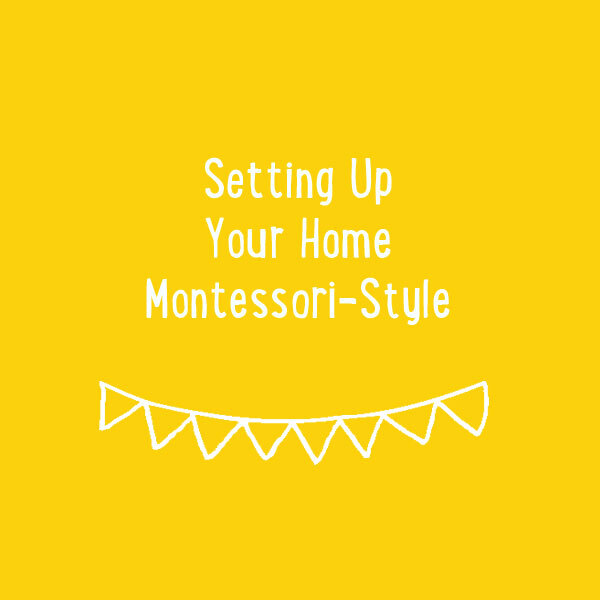 I hope that this was useful to some of you and I’ll be back with more Montessori inspiration very soon.